This is the chart that everyone likes. 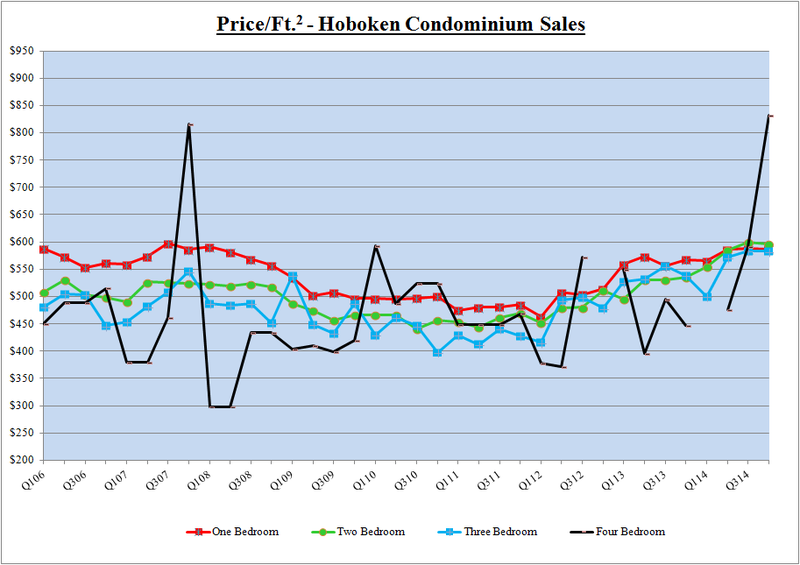 It shows the price per square foot by neighborhood for Hoboken overall. Click on the graph for a larger view. Prices again are at all time high, this is a good indicator for real estate market. This also indicates the high demand of residential properties in the market and good economic conditions. Notice how prices for one and 2 bedroom condos are all going up since Q1 2012. Trend is same for 1 and 2 bedroom properties. Prices for 3 bedroom are also appreciated with the overall market conditions. 3 bedroom category are always been the choice of buyers. Trend is upward and prices are again expected to go up during last quarter of the year. The great thing about this graph is it puts the weekly and monthly observations into a broader perspective. The trend is clear that prices are going up. The trend line for studios and 4 bedroom is highly fluctuating due to less inventory of these kind of properties in the market. After the crash in October 2008, Trends were at their lowest points in Q1 2012. Prices are regularly appreciating since Q1 2012 with slight increase or decrease over the period. 1, 2 and 3 bedroom, all has recorded the upward trend in this period. People would rather try and hold on, they would like to keep track of the trends and would like to wait and watch. Risk are on the peak and prices may go up or down. Notice how 1 and 2 bedroom reached their all time high in this quarter and it is expected to increase in next quarter as well. If you are looking to sell your property, this is the best time. Check how much your property is worth with our Property Value Estimator tool. Notice that 1 and 2 bedrooms largely follow the same upward trend since Q1 2012. There is much more volume in Hoboken in 1 and 2 bedrooms with 2 bedrooms roughly 2/3 larger than one bedroom sales in terms of units. Q4 2010 recorded lowest price for 2 bedrooms. 2014 also maintained the same upward trend from Q1 2012. Prices were not highly appreciated in this quarter but increasing with a steady growth rate. This is good for investors and sellers. The number of studios and 4 bedroom sales in Hoboken is small in absolute terms so even one purchase with a very high or low price per square foot can swing the average. So, I largely discount this as an indicator.